Passend zum neuen Star Trek Online Patch, dem Season 1.1 Supplemental Patch, wird es mal wieder Zeit für ein kleines Update aus dem Star Trek Online Universum. Mittlerweile bin ich zum Captain Grade 2 aufgestiegen, der weitere Weg hat mich nun in den Bajoranischen bzw. Cardassianischen Raum verschlagen, wo man sich mit einer Menge an Jem’Hadar rumschlagen muss. Dabei haben gerade die letzten Änderungen des letzten Patches erheblich zum Spielspaß beigetragen. Denn auf Elite sind die Missionen hart, was das Ganze natürlich extrem spannend macht, da man kontrolliert spielen muss. Den besonderen Kick verleiht dabei das neue Injury-System, da Sterben nun deutliche Nachteile mit sich bringt und zudem nicht gerade billig ist. Statt auf Max-DPS zu stetzen, packt man so lieber mal das Heal-Kit aus, um sich und seine Crew zu verarzten. Eine Tatsache die vorher kaum der Fall gewesen ist. Dadurch bekommt das Spiel nun deutlich mehr Tiefe und Komplexität. Die ersten blauen und epischen Items konnte ich so schon looten. Wer allerdings beim Leveln Wert auf Geschwindigkeit legt, spielt weiter den trivialen „Normal-Modus“, da man hier deutlich schneller levelt. Da ich aber getreu des Mottos spiele „Der Weg ist das Ziel“, bevorzuge ich den Elite-Schwierigkeitsgrad, auch wenn das Leveln dadurch insgesamt etwas länger dauert. Mitte der Woche gab es dann den letzen Patch aus der Season 1.1 Reihe, mit der Bezeichnung Supplemental. Im Fokus stand hier das Star Trek Online Crafting System, was derzeit kaum vorhanden, bzw. sehr kryptisch gelöst war. Hier schafft der neuste Patch nun Abhilfe und bringt Klarheit mit einem neuen Crafting System. Sprich nun weiß man, was man später bauen kann, was für Materialien man dafür braucht und das Wichtigste: Wie sich die Skillpunkte beim Craften entwicklen. Das neue Crafting System lässt sich via Menü „View R&D Progress“ an der Mini-Map aufrufen und verschafft sofort Klarheit. Insgesamt stehen drei verschiedene Schwerpunkte neben dem General-Research zur Verfügung: Energy Fields, Physical Science und Technology R&D. Ich habe mich selbst mit dem Thema Crafting noch nicht näher beschäftigt und wollte dies verschieben, bis ich das maximale Admirals-Level erreicht habe, da Berufe skillen in der Regel lediglich aufhält. Die gesammelten Mats habe ich vorsorglich erst Mal in die Bank eingelagert. Our latest Special Task Force mission, „Undine Terradome,“ presents all new challenges and introduces a new menace to Admiral-ranked players. It all starts simply enough: You’re tasked with investigating a strange energy signature, but things quickly take a turn for the dangerous when you uncover an Undine terradome! As you investigate its exterior, you’ll happen upon a Federation ship captained by none other than Akira Sulu, Admiral Quinn’s stalwart officemate back on Earth Space Dock. Something seems off about him, though …. Once you’ve sufficiently pacified the space surrounding the terradome, you’ll beam down to its decks and discover some familiar surroundings: Inside, it looks very similar to DS9. The Undine are planning to invade Federation space! As you make your way through the Undine DS9, you’ll rescue captured Federation officers, eventually moving to the bowels of the terradome to engage the Undine mastermind behind the invasion plan. Can you prevent the invasion from occurring? Play „Special Task Force: Undine Terradome“ to find out! Die kompletten Season 1.1 Supplemental Patchnotes findet ihr hier. Ende des Monats geht dann Star Trek Online mit dem Patch 1.2 in die nächste Runde, wo hoffentlich wieder viele gute Neuerungen den Weg ins Spiel finden werden. The Terradome is now available to players! Take your level 45 character out into borg space and try it out! STF- Khitomer Accord – Reward mission for the „Assimilated“ Accolade, is now available to players. The mission will be granted to anyone that has already completed the Accolade or to anyone that gets the Accolade from this point forward. Skyfiles across the entire game have been optimized. Sulu has been promoted! Samuel Winters is now the contact for all patrol missions. Where’s Winters? He’s located in Admiral Quinn’s office in Earth Space Dock. The Constellation ship name has been fixed so it no longer says Cheyenne. You can now look up Memory Alpha R&D progress and recipes at any time by using the drop down on the mini map, however you MUST be standing near an appropriate console at Memory Alpha to create the item. The create button will light up when you are standing near the console. Opening the appropriate computer console at Memory Alpha also brings up the R&D UI. There are 7 areas of research. All players start with Basic. Once you max out your Basic level skill, the other 3 stores (Energy, Physical, Technology) will open up. These stores also have advanced recipes that can be learned once you’ve maxed out the standard items. 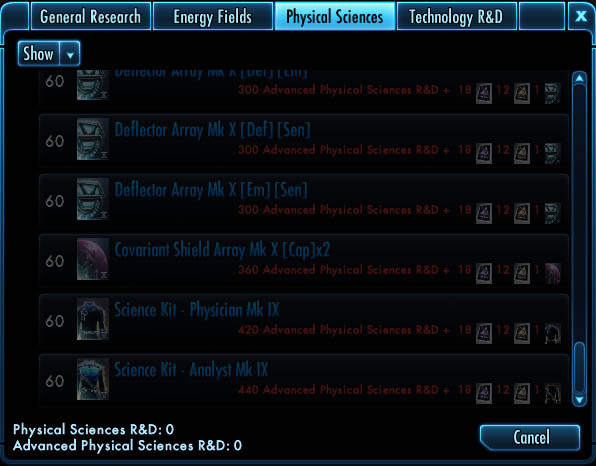 The research skill you will receive is listed to the left of each item. Items you cannot make yet, will be grayed out. The skill required to make the item is listed next the recipe component requirements. Any Memory Alpha progress you had prior, will be converted to the approximate new skill amounts. Due to some store restructuring, this may mean that some items you were previously able to make may require more skill than you have now, but it will be close. Hovering over preset buttons will update your costume in real time. Headshots now appear for team members that are not on your map. There is now a notification messages for when an injury is automatically removed after a set amount of time passes. Ship and BOff deletion now requires name validation. The “Contributing” art for the skill picker has been improved. Fixed some issues with „for next“ values for rank and grade on the experience bar tooltip. These values should all be accurate now. Miracle Worker has been updated so the chance to repair damaged subsystems is 100% when activated.